Four months of bed rest?! It sounds like an impossible feat of boredom- and worry-dodging. One warrior mama shares her experience and tips for making it bearable. "These women often feel very lonely," says Leticia Ann Victorino, L.C.S.W., the social worker who leads the group. "They also have a lot of fear of the unknown." For some of them, the slightest activity—even showering—could spark a premature delivery with an uncertain or potentially devastating outcome. "These women often come from a place where they had very active lives with full-time jobs or families, and then are suddenly placed on 'house arrest' and expected to act like couch potatoes," Victorino says. Enter the bed rest support group. The idea is the brainchild of Jessica Fisher, who in late 2011 was desperate for a way to allay the boredom, constant worry and isolation that accompanied her four months of bed rest while pregnant with twins. "My OB discovered that my cervix was basically open during a routine 19-week check up, which meant my babies were in trouble," Fisher recalls. "He said, 'You have to go to the hospital right now.' I couldn't even go home and pack my bag. Instead of finding out the sexes of the babies, I went right to the hospital and didn't leave for 126 days. It felt like I had been kidnapped from my life in the middle of the night." After successfully delivering full term twins Ella and Ethan on April 21, 2012 via C-section, Fisher wanted to continue to help women on bed rest, coaching them through the process with her new expertise. She recently launched her own business, Bed Rest Life Coach, which is essentially life coaching with an emphasis on bed-resting moms-to-be. Women can purchase a customized package including features like an in-room consultation, phone or video chats, VIP access to Fisher's private Facebook group of current mothers on bed rest as well as bed rest veterans, and even postpartum support calls to "teach them all about how to recover from the muscle atrophy [which often occurs during prolonged bed rest] while taking care of a newborn at the same time." There are also options for remote baby registry advice ("Putting together a baby registry without being able to physically go into a store makes this process very challenging," Fisher says) or support calls for partners. Some wonderful long-term friendships have emerged as a result of the UCLA program Fisher inspired (which has helped more than 100 women in the past year): "Graduates" still get together for play dates and post on their private social media channels to help each other out. "We're like a sorority," she observes. "There's such a deep bond from having gone through what we went through and such an appreciation for our babies. We recognize that there were miracles that happened. It's another level of friendship." 1. Personalize your room. For Fisher, that meant orchids on her windowsill, a large portrait from her wedding day, and red heart decorations at Valentine's Day. 2. Try to do some "normal" pregnancy things. 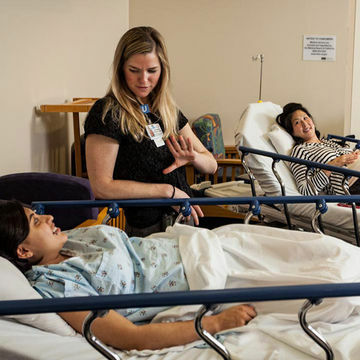 If you can't make it out to your baby shower, bring the baby shower to you: Many hospitals will allow you to have a small party, perhaps in the dining area or a private waiting lounge (or have it at your home if you're on home bed rest.) Hire a manicurist to give you an in-bed mani/pedi. Schedule that maternity photo shoot you always wanted, but ask the photographer to shoot strategically so no fetal monitors or other medical equipment are seen. 3. Keep baby gifts in sight: "I had something called a trapeze bar over my bed to help me get up to use the bathroom," Fisher recalls, "and every single piece of clothing I got for babies, I hung up there. I'd look at them every day and picture what our babies would look like. You're always expecting the worst, worried any sneeze will ruin it. I wanted to change that mindset to 'This bed rest is going to work.'" Keep toys, stuffed animals and even your breast pump out in the open for motivation and inspiration. *Ironically, the moment you become a parent, that scenario actually sounds like a comfy utopia.